My dad decided to take a leap of faith and leave the hustle & bustle of NYC to move to a slower pace city of Austin. My fiancé, his daughter and I came out there to see what Austin is all about. This is my list of MUSTS. Get to witness 1.5 million bats fly over Lady Bird Lake. Yes, 1.5 million. It’s insane to see and it happens every night. I’d advise getting there early to get a good spot. Some people were in the park on blankets below and others were on boat tours or kayaks. We stood on the bridge and I feel it was the best spot to see the bats fly out from underneath the bridge. Plus we didn’t have to worry about getting guano on us. Also prepare for the unpleasant smell as they fly out but at least you’re outside. The bats usually fly out once the sun sets, so you may be waiting a while but again, I’m glad we got there early to get a front seat view on the bridge. Plus it’s FREE. It’s a great way to start off your time in Austin, the kids will love it too. This was by far THE best and my FAVORITE place we visited. First off, you have to reserve your time and spot ahead of time. Make sure you do it in advanced. I recommend going to the earliest one you can find because we had the pool to ourselves for a little bit before people arrived and then it got a little crowded. They only allow a certain amount of people there at a time and only for a limited time window until the next group arrives. It’s also an inexpensive activity, which is always a plus. We went in the height of Austin’s summer in August and it is no joke. So later in the afternoon is a no go for being in the sun. But even though we arrived at 9am, it was still warm enough to swim. I was mesmerized by the beauty of this place and words don’t even do it justice. You have to visit. Please respect the nature and beauty of this place, be a responsible traveler; Don’t leave any trash and take in what our planet has to offer. Again, Austin is hot in the summer. So any excuse to cool off we were in. 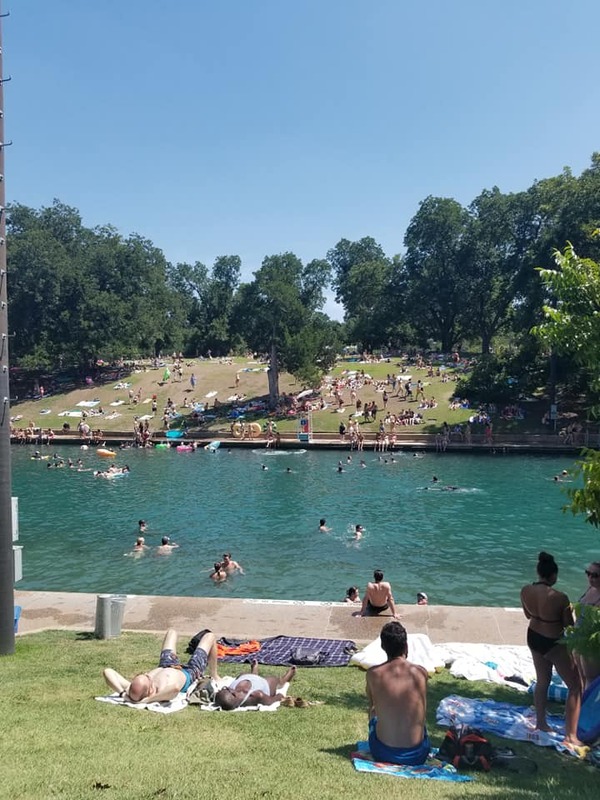 Barton Springs is another natural pool that stays cool all year round. It was another cheap option to spend some time in the sun and relax. It can be a little crowded at times the pool itself is 3 acres so there’s lots of room to swim. Lake Travis is a fun place to visit, whether you want to zipline or do water activities. We chose to do ziplining, it was a 3 hour tour which included a decent hike to each platform. The views were gorgeous, we made sure we picked the earliest tour because of the heat. The tour guides we had were hilarious and made the day fun. I highly recommend trying this out or checking out what Lake Travis has to offer. 6th street is famous for bars and restaurants, if you’ve ever been to New Orleans, it reminded me of a mini Bourbon Street. It’s also a bit of a younger college crowd, which wasn’t really our thing but we still had a good time. Rainey street is another section of Austin that has bars and restaurants. We liked Rainey street a lot more. Coming from the NYC area, we were absolutely shocked about how cheap the drinks were. 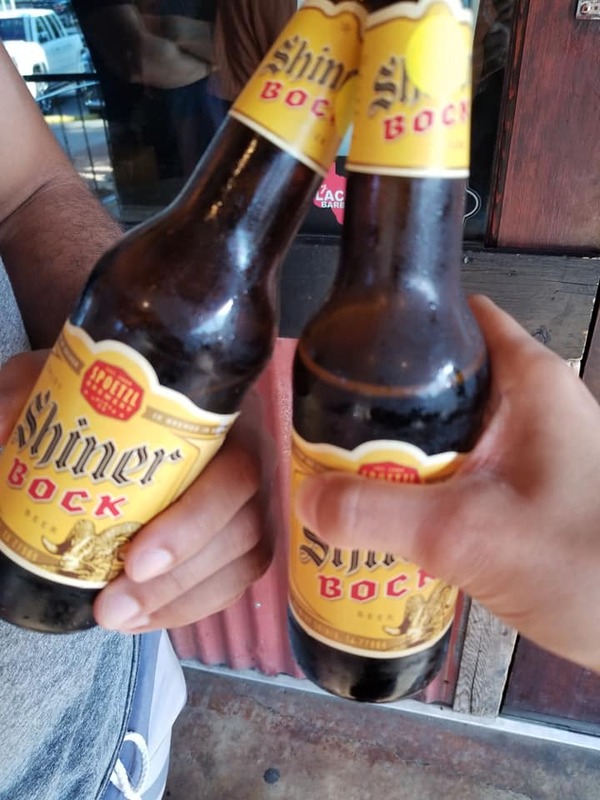 Austin is known for their live music scene, if that’s your thing almost every bar has live music playing. We actually loved Bat Bar, it had a cool vibe, the shots were good, prices were cheap and of course the music was good. Lady Bird Lake is BEAUTIFUL. There’s a lot to do like bike riding, rent boats/kayaks, you can go paddle boarding too. We wanted to have a relaxing day and we took out kayaks for a few hours. This is also the same lake where the bats fly over. So some people rent out the kayaks and boats right before the bats fly out. Some people brought their dogs on the paddle boats too, which was adorable. Have a relaxing day, get some exercise and enjoy the beauty of Lady Bird Lake. Longhorn Caverns is about an hour or so drive from where we were in Austin. We chose to do this tour to experience something a little more out of the city center. A river used to run through the caves we got to walk through. 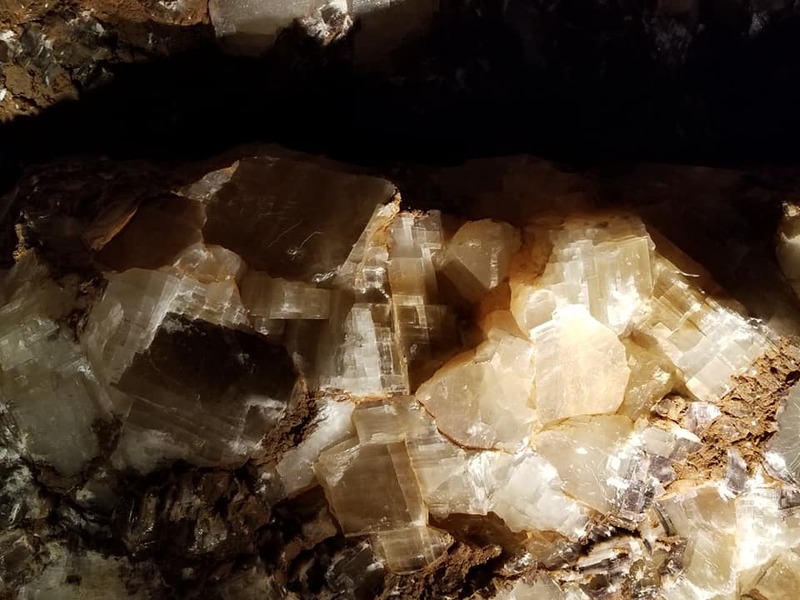 It was a 90 min tour of walking through the depths of the cave. They had crystal “rooms” and even some cute bats lived there too, which they called “nuggets” because they’re so tiny and look like little chicken nuggets hanging from the ceiling. Banger’s is famous for their sausages and beers. 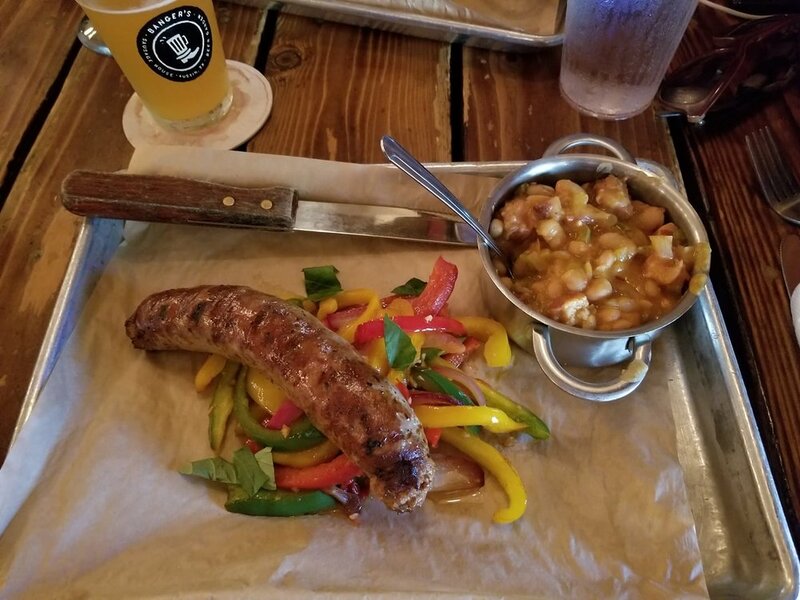 They have 30 sausages that they make in house and over 100 beers on tap. They have vegetarian options as well. The ambiance is chill and laid back with german style beer garden benches and wooden tables. The staff are super nice (which may be something we’re just not used to coming from New York), but they are also knowledgable about their beers, which helps with narrowing down your choices. I ordered sausage and peppers with baked beans and pineapple. It was so delicious. I was disappointed we didn’t get to experience their famous “manmosa” during their brunch hour but there’s always next time! So there is a lot of debate in Austin as to where is the best place to get BBQ. We tried Salt Lick BBQ which is another popular spot, I wasn’t a fan mostly because I thought the food was bland. Another place we heard about was Franklin’s BBQ but after speaking to some locals, we heard it’s not worth it. Plus the line is always hours long and I don’t think any place is worth standing outside for hours in my opinion. We were almost at the point of being sick of BBQ but we decided to try one last spot. Terry Blacks BBQ was by far the best bbq we had during our stay in Austin. The sauces alone are what sold me. They only enhanced the meat’s flavor and the sides are also yummy. I recommend getting their green beans, I could have had a bowl of them. There was a decent line at Terry’s but it went fast. They had a bar window outside and near the door once you entered where you can order a cold beer while you wait on line. I mean, can it get any better than that? We did a lot in Austin during our stay, our bellies were filled with delicious food, our skin were tanned by the hot Austin sun but being that it was my first time exploring Austin, I absolutely loved it. I’m happy my dad found his new home and I look forward to many more trips to Austin and the chance to find new gems.